On Thursday, Myanmar’s government will sign a peace agreement with some of its armed ethnic groups. The agreement has been under negotiation since 2011. However, Myanmar’s government failed to convince all 15 of its armed ethnic groups to sign the peace agreement. Instead, only seven of the ethnic armies will sign the agreement on Thursday, in a lavish signing ceremony in Naypyitaw, the nation’s capital city, to be attended by foreign diplomats. However, eight of ethnic armies have refused to sign. 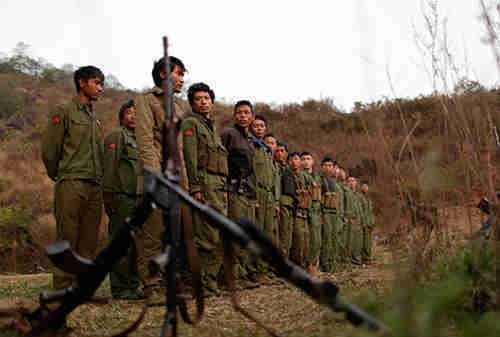 Two other ethnic armies, the Shan and the Kachin, are still fighting Myanmar’s army, and do not wish to engage in a peace process. This is not the first ceasefire agreement that the government has signed. In fact, according to the International Crisis Group, Burma started signing peace agreements with ethnic armies in 1989, as an intended process of national reconciliation, after the civil war of the 1950s. Needless to say, some of these peace agreements did not last long, and sometimes the same ethnic army had to sign peace agreements more than once. From the point of view of Generational Dynamics, this situation with multiple peace agreements is a complex example of something that I have discussed a number of times before with respect to other countries. Among generational crisis wars, an external war is fundamentally different than an internal civil war between two ethnic groups. If two ethnic groups have lived together in peace for decades, have intermarried and worked together, and then there is a civil war where one of these ethnic groups tortures, massacres and slaughters their next-door neighbors in the other ethnic group, then the outcome will be fundamentally different than if the same torture and slaughter is rendered by an external group. In either case, the country will spend the Recovery Era setting up rules and institutions designed to prevent any such war from occurring again. But in one case, the country will enter the Awakening era unified, except for generational political differences, and in the other case, the country will be increasingly torn along the same ethnic fault line. One path that the Recovery Era can take is that the leader of one ethnic group decides that the only way to prevent a new civil war is for him to stay in power, and to respond to peaceful anti-government demonstrations by conducting massive bloody genocide, torture and slaughter of the other ethnic group, in order to maintain the peace. (I assume, Dear Reader, that you have grasped the irony of the last sentence.) That appears to be what Robert Mugabe has been doing in Zimbabwe, what Bashar al-Assad has been doing in Syria, and what Pierre Nkurunziza has begun to do in Burundi. When there is a generational crisis civil war between two ethnic groups, the groups stop fighting with each other out of exhaustion when the war ends with a climax, and the country enters a Recovery Era. Starting around 20 years later, the younger generations that grew up after the war begin to make themselves felt, and they begin clashing with each other or with the government out of anger left over from the civil war. This has been happening for several years now in Thailand, in clashes between the “yellow shirt” Chinese descendants and the “red shirt” indigenous Thais. What happens is that each clash ends with some kind of peace arrangement that lasts until the next clash begins. This alternation between clashes and peace continues for decades, with each clash worse than the previous one, until there is a new full-scale crisis civil war decades later. So instead of just two ethnic groups alternating between clashes and peace agreements, Burma has multiple peace agreements with different ethnic armies, leading to an extremely complex set of interlocking situations. In addition to an ongoing conflict in Kachin and Shan states, Burma (Myanmar) has continuing problems with Rohingya and Kokang. We have reported several times earlier this year of the plight of the 6,000-8,000 Rohingya migrants who were stranded in vastly overcrowded boats in the Andaman Sea off the coast of Thailand, Malaysia and Indonesia. Rohingya Muslims in Myanmar (Burma) had lived there for generations are being slaughtered and driven from their homes by Buddhists led by Buddhist monk Ashin Wirathu. The Rohingyas, described by the United Nations as “the most persecuted ethnic group in the world,” are not even recognized as Rohingyas by Burma’s government, who refer to them as Bangladeshis. Because of the Buddhist violence, they have been fleeing Burma into the Bay of Bengal in small boats, heading south and hoping to land in Thailand, Indonesia or Malaysia. Instead, these countries refuse to let them land on their soil, and they’re stranded at sea. For the past fifty years, under successive military juntas, Myanmar has followed a strategic project of Burmanization, i.e. the promotion of a single religion (Buddhism), language (Burmese) and culture (Burman). At its mildest, this is a policy of cultural assimilation. At its worst, it has verged on – and arguably pursued – ethnic cleansing – of the Rohingyas, and other ethnic minorities. The Kokang people are ethnic Chinese who even use a Chinese phone network and spend Chinese money in this region. In 1989, Burma’s government signed a peace agreement with the Kokang, but there’s been fighting five times since then. In 2009, an anti-drug crackdown by Burma’s army forced 30,000 Kokang to flee across the border into China, where they were put into refugee camps.